Net Weight: Packet (55 seeds)5lb (6000 seeds) (+$42)50lbs (60000 seeds) (+$385) This item is currently out of stock! 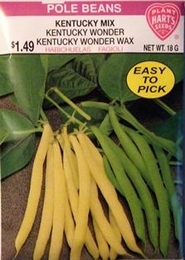 This mix contains the 2 most popular home garden pole beans 50% Kentucky Wonder (green) and 50% Kentucky Wonder wax (yellow) in one fun to grow packet. Stringless and tender when young the pods are rich in flavor. Kids marvel at these tall plants which can be grown on poles, fence or trellis. Pole Beans may be grown on fence or trellis. For best quality and yield pick pods when young, about 4-5 inches long. Seed spacing - 4-6 seeds around each pole.